Here at DCS Multiserve, we are passionate about cleanliness and hygiene. We continuously provide excellence in all matters relating to your washroom services and hygiene needs throughout the UK, ensuring an environmentally friendly, comfortable and safe environment for all your staff, visitors and customers. Either as part of an office cleaning package, or as a standalone service, we can take responsibility for the cleanliness and maintenance of your washrooms; allowing you to focus on your core business. We can arrange for the regular cleaning of washrooms in both commercial and industrial premises, ensuring a clean, presentable environment for users, and providing the best impression of your organisation. This service includes the provision of all consumables, such as hand towels, hand wash, toilet roll and other products visitors may need. We will also take responsibility for hygienic supply and emptying of sanitary bins, disposing of the waste on an environmentally-friendly way. 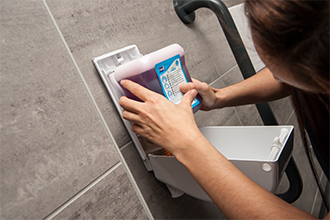 Our washroom service also includes the supply and maintenance of hand dryers, and the provision of vending machines and air fresheners; everything you need for your washroom can be covered by us. At DCS, we believe in a tailored approach and pride ourselves on working not only for, but with our clients in defining a schedule that will best meet the needs of your business in providing a cost-effective service that you can rely on. To discuss arranging washroom services for your organisation, call a member of our team today on 0191 216 9000 or email enquiries@dcsmultiserve.co.uk.